KoopaTV: Terror in Manchester, UK! ...Hey, Where's Vortexica? Vortexica's last published article was his experience at the The Legend of Zelda: Symphony of the Goddesses - Master Quest concert back in October 2016. Guess where one of the concert venues was? MANCHESTER. ...No, not the Manchester Arena. Rather, The Bridgewater Hall. 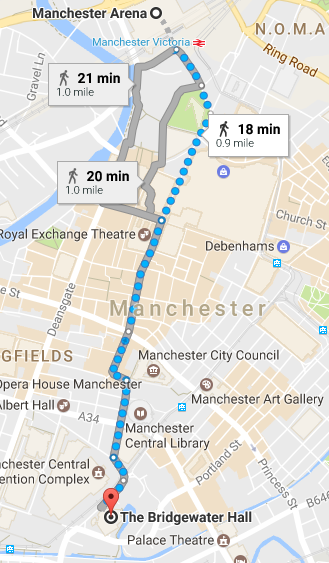 But, hey, the two venues are only a mile away on foot. Vortex could've easily transformed into a helicopter and flew over if he didn't feel like walking. It makes you wonder what would happen if they bombed the Zelda Symphony? But, anyway, we haven't exactly had communication with Vortexica since that symphony took place. That's why none of the comments in his comments section were replied to. It's presumably why KoopaTV Adventures is still stuck on Episode 1! Now, we're not saying that Vortex died in October. Obviously not. BUT, SOMETHING has happened to him between then and now, and there was just a terror attack, and I recently sent out a message to all of the KoopaTV staff members asking if Vortex was alive. ...Curiously, Wendy O. Koopa decided to reply and said that she was alive, but that doesn't answer the original question. Not all of the victims in the Manchester attack have been identified. One of them could be Vortexica. ...Can robots even die? I don't know. I know they have birthdays, and Vortexica's is May 27. We mentioned it last year. If they can be born, they can be... killed. We're no strangers to having KoopaTV staff members be killed by terrorists, and by ISIS in particular. It turns out that ISIS has taken responsibility for the Manchester Arena attack, so that leads me to believe that it is likely that they did this just to attack Vortexica. After all, as mentioned, ISIS has a history of targeting KoopaTV staffers, both as victims and as recruits. This all assumes that Vortexica would wish to attend an Ariana Grande concert. However, we know that music is important to him, so why wouldn't he? For all we know, he might've thought this The Legend of Zelda music/tribute video featuring One Last Time by Ariana Grande was actual music from the game. There's one other explanation I can think of for why we haven't seen Vortexica: As mentioned a year ago, all of the Daylight Savings Time shenanigans makes things impossible to coordinate. It's possible that all of this could have been preventable had President Donald John Trump read my letter to abolish Daylight Savings Time: He still has not replied to it. Sad! Anyway, he could be alive but we'd never be on at the same time. Or, he fell into a gap in space-time due to all of this manipulation. We might never know, but hopefully we'll get him back by E3 2017. We're dispatching KoopaTV reporter Roxy over to the United Kingdom to investigate. ...Hopefully we don't lose her, too! KoopaTV has the victims of the Manchester Arena terrorism attack, whether they include a KoopaTV staffer or not, in its surviving staffers’ hearts and prayers. KoopaTV is adamantly opposed to terrorism, whether it come from ISIS or Mario. Sending a staffer to do footwork over in the United Kingdom to find another staffer may deplete KoopaTV's budget for the year, but the KoopaTV Loyalty Rewards Program prizes are already paid for for the rest of the year, as is KoopaTV's top-level domain renewal. Please let KoopaTV know if you have any clues as to Vortexica's whereabouts or existence in the comments section. Today is also World Turtle Day. Read Vortexica's write-up on it from a year ago here in his memory. Vortexica was eventually confirmed alive, but butchered by fidget spinners. Vortexica may be incapacitated due to the horrors of Great Britain, but he's alive. Just in fear. The E3 2017 presenters never acknowledged the Manchester attack. Vortexica finally gives the full story about what happened to him in 2017, including all of these terrorist attacks. A year later, the UK's problems move from ISIS to Cappy. Repeated threats on Vortexica's life have finally taken their toll. Thoughts and prayers = Winning formula. He can say with 100% certainty that he's legit missing in terms of our knowledge, yes. Maybe he's not missing from someone else's point of view, but as far as we're concerned and what we're privy to, we haven't seen him since... a month when he live-reacted here. Vortexica always seems to reappear when you least expect him to. I would not be surprised if he showed back up tomorrow. Uhhhhhhhh how would you know? This is why they should have never stopped funding Dracula and his extremely loyal soldiers, way back in the day. Ahhhhhh~ now that was a guy who really knew how to get his point across. I wish he'd resurrect already, like he does in all those movies and video games. Bring back public impalement! It's not just a resounding message to 'terrorists', it's also entertainment for the whole family~! This is a remarkably well-researched and referenced comment and you get full credit. I never saw Dracula as a stalwart against the spread of Islamic terror, but... I guess historically he was! Seems like we need someone like Vlad the Impaler again. Wait wot are you doing here in the comments section?